Exploration and pushing ourselves away from our own little comfort zones is an ideal way to learn and to grow. And, as we evolve, the places where we live might not evolve with us. What seems “the best” right now might not be the best for you in a few years’ time. But wherever you were born or raised or settled down to raise a family also might not be the best place for you to live! It’s okay to move and change. Obviously, I’m biased given my personal track record of places I’ve called home. But there are just so many places in this giant world that, surely, there is no one right, perfect, “best” place for everyone at all times! There are lists and surveys and opinions and “facts” floated around in all variety of outlets to call anywhere the “best” place. Those statistics on expat destinations are listed in blogs, magazines, real estate websites, and more. Heck, I’ve contributed to a bunch of them! But here’s the thing: You can find someone somewhere telling you that every place is the best place. I believe in movement and change. I think living more nomadically is better for humanity and for the environment. That’s why I don’t think any one location is the best in the entire world in every single respect. But you can find a place that’s right for you for now. And then find a new place that’s right for you when you change! You can keep moving on, pushing your own boundaries and meeting new people to break down barriers. I would love to see us all move more. I think we can create our best lives in the best places for what we need at that time. We would all benefit from that flexibility and opportunity. Alas, I realize that’s easier said than done for many of us. Legally, logistically, culturally, linguistically…we’re all different. And, unfortunately, a bunch of fake lines separates us. If and when you’re able to cross them, I hope you do. I hope you reach out and learn about someone who seems to be different from you; I guarantee you’ll find a whole lot more in common. We have recently lived in both Roatan, Honduras, and on the Mediterranean island of Malta. You can find tons of information on moving to or traveling around either island by following those links. 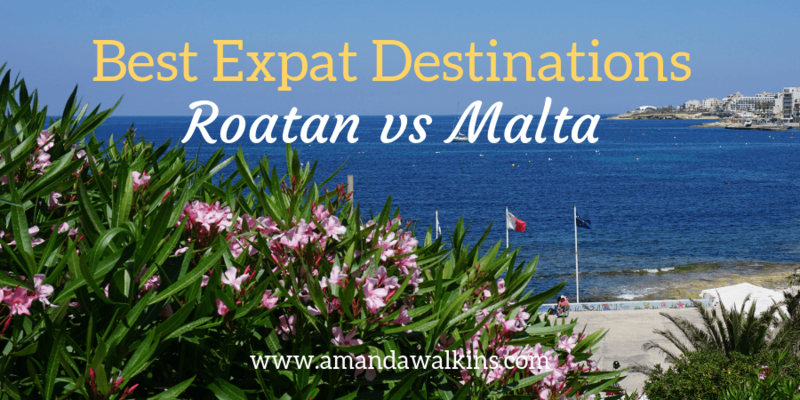 What I’m aiming to do in this post is to simply offer my observations as a comparison of Roatan and Malta as expat destinations. I have lived in both popular expat spots, and I field frequent questions from potential expats of both locations. What’s best for you is entirely up to you to decide. Both places were wonderful to me and, yet, we’re not living in either place right now! I’ll go through various topics and outline my thoughts on both expat destinations. But, please…take it all with a grain of salt! How you feel about a place will and should be different than how I feel about it. The only way to know if it’s right for you is to go and see for yourself. Since I can’t say there are tons of expats who have lived on both islands, I do think we offer a unique perspective for these two expat spots. I hope it helps you in choosing your best expat destination…whether that’s for right now or forever. Both of these islands are hot. But they are very differently hot. Malta felt much more oppressive to us, despite the lower humidity than in Roatan. The temperatures were consistently higher in the summertime than they were in Roatan, but the kicker is the construction. Homes in Malta are not built with insulation in mind, so the heat stays inside the buildings. Despite fans running all day, the air consistently felt thick. Nighttime temperatures in Roatan were generally lower than in Malta during the summer. But the humidity was much higher in Roatan. My hair loved it, but most people find that level of humidity to be too much. The winter is another story! Malta does get more of a winter than Roatan. Roatan experiences rainy season, while temperatures still remain comfortable. Although they feel cold to those of us who lived there long enough to acclimate! The cold in Malta is more of a damp cold that, again, doesn’t really leave the buildings. It gets inside and there is no central heating. Hot water bottles, space heaters, and multiple duvets are common wintertime necessities. Oftentimes, it’s warmer outside than it is inside. So that’s all the bad stuff…now for the good. Both islands offer abundant sunshine! The sunsets are epic and your skin will bask in the warmth of the sun. The island lifestyle will become your new norm, with morning swims in the sea and happy hours on the shore. Sunny places make it easier to meet people since you spend more time outdoors. Enjoying a beer al fresco after work means friends or neighbors might walk by and decide to join you. It’s just easier to bump into people when you’re moseying along with your face toward the sun. Unfortunately, huddling against the cold and dashing from door to door to not freeze to death does not encourage leisurely conversation on the sidewalk. Sunny places also just make people happy…or is that only me?? As an EU Member State, Malta has enjoyed a generous influx of EU investment in recent years. New roads, infrastructure improvements, buildings facelifts, and general upgrades have all helped. That being said, driving in Malta is still a game of Mario Kart/Grand Theft Auto…depending on the day. Driving in Roatan is also an adventure, although it feels more appropriate given the economic development of Honduras as a whole. With that in mind, you’ll have to adjust to potholes, roadblocks, and government inefficiencies galore to live daily life there. We had one very quick power outage in Malta once, but otherwise experienced no power fluctuations at all. Roatan regularly experienced them and they could last for hours – up to days – at a time. It took me about a year after leaving Roatan to feel comfortable letting my electronics go down to low battery. In Roatan, I desperately kept them all up as high as possible, knowing that a power outage could happen at any time. It’s just an island life quirk you deal with there! Generally speaking, Malta is much more highly populated and better connected to Europe and Africa. Everything from groceries to deliveries to travel off-island is much cheaper than in Roatan. That’s generally speaking in a comparative sense. We’re talking Euros to Lempiras, but the costs of imports in Roatan was high. That being said, the cost of life in general in Malta is slightly higher – simply because it’s in Europe and not in Central America. You can certainly live more cheaply in Malta if you avoid the higher-end areas, though, so the overall costs can be fairly even. There is nothing quite like living and traveling around Europe. It’s just so easy, so cheap, and so convenient. And yet, locals always complain about it – that’s something we do the world over! Getting around Malta is cheap by bus. It’s only €2 for a bus ticket that’s valid for any distance and can even be used for a transfer within two hours. That’s if you pay cash; if you get one of their Tallinja travel cards, you can save even more on bus journeys. In Roatan, buses are even cheaper! You also don’t need to get to a specific bus stop, there’s no bus timetable you have to adhere to, and you can just yell out when you want to get dropped off at the door of your destination. Maltese buses run more like the rest of Europe and the U.S./Canada, where you must get on and off at designated stops that could be a mile from your destination. Pros and cons to each method! In terms of travel off of each island, there’s no comparison. From Malta, there are multiple daily flights to a variety of destinations around all of Europe, North Africa, and the Middle East. These flights are cheap, regular, and convenient. Getting off of Roatan is much more expensive and more limited in scope. Roatan is very well connected in comparison to some other Caribbean islands. But that doesn’t negate the fact that taking a 2.5-hour flight to the U.S. costs as much as (and often much more than!) my 6-hour flight from Europe to the U.S. costs. Roatan does offer the ferry to the mainland as an alternative means to travel. It’s known as the Vomit Comet. In contrast, Malta offers regular ferry service to Sicily that is not known for its ability to make you ill.
Roatan also offers a ferry once a week to its sister island, Utila, and arrangements can be made to get to Guanaja. In contrast, there is all-day everyday ferry service to Gozo, Malta’s sister island, and the other island, Comino, is easily visited by another ferry or by any of a variety of boat tours. Both Roatan and Malta employ English as a common language. But both Roatan and Malta have a significant portion of their local population who prefer to speak a different language (Spanish in Roatan, Maltese in Malta). Given that Spanish is much more common, more visitors and potential expats might speak that language. You could at least learn enough to get by with locals who may not speak much English or who simply prefer to communicate in Spanish. Maltese is only spoken by the native population of Malta – and not even all Maltese learn to speak Maltese. So it’s highly unlikely that a potential expat will speak it. It’s also incredibly difficult to learn. That being said, moving to Malta means you should make an effort to at least learn a few words and pleasantries. At the absolute least, learn to recognize the names of places and common terms in Maltese so you can read signs and better get around. I truly, honestly, absolutely cannot say enough about the wonderful people of both islands. What I will point out is the changing nature of both. In Roatan, the increase of tourism has brought the need for more workers. That invited many mainland Hondurans to the islands, which is also the basis for the increase in monolingual Spanish-speakers. Islanders traditionally speak English at home and learn to read and write in Spanish at school. In Malta, joining the EU opened the doors to all EU citizens to move to the island and to work. This has certainly changed the face of the local population. Additionally, Malta received a large number of migrants early in the Mediterranean crisis in recent years. Add to that the very stable Maltese economy and attractive corporate taxes and you see an increase in foreign investment and business on the islands. Both islands are experiencing change, just like everywhere on Earth. In both places, the expats who have been there a while will lament the changes. Whether the change is good or bad, it is hard on those who feel left behind or who pine for the way things were. But change is inevitable, so recognize that first before you even move. Next, recognize that change for a local population will affect an expat population differently. Please, respect the fact that change can be necessary and positive for locals, regardless of your emotional attachment to a way things were when you arrived as an expat. At the end of the day, you are a guest in this country, which you must remember. Both islands are known as scuba diving destinations, but they are so very, very different! Roatan is skirted by the second-largest barrier reef in the world, which is generally very healthy and teeming with life. Malta is surrounded by World War II wrecks and the dark history they bear. Planes and ships rest along the sea floor, many of which carried their occupants to a watery grave. These are still memories for people living today, so there is a certain solemnity in exploring the dive sites around Malta. There is also very little marine life in the Mediterranean these days. This is the tragic consequence of human activity, primarily overfishing and pollution. As such, a single sighting of any marine animal in a dive is not abnormal. I’ll say that again: Seeing one single, notable, living creature around Malta is normal in a 30+ minute dive. While diving in Roatan, you could practically (please don’t actually) high-five 3 different turtles in a dive. You could also see a free-swimming moray eel, several rays, and maybe even a shark or some dolphins. That just is not happening in the Med right now. That all being said, I never dove in Malta so this is all secondary information. Of course, my source is my husband, who worked as a dive instructor in both locations. But I never dove in Malta for another important reason: It was too cold for me to find enjoyable. Now, please carefully note the following: I used a 7mm semi-dry in Roatan. You may now judge…I’ll wait…okay, so back to diving. In Malta, even during the summer, you definitely won’t be out there in a shortie, and you might even want a hood in mid-summer. That’s just not my style of diving, so I didn’t dare venture out. If you’re new here, just know I miss the humidity of my Caribbean island and the cold of my home in Scotland is a perpetual problem. I’m a warm-weather gal through and through! Both Malta and Roatan are very popular as diving destinations and both have deserved those respective reputations. I won’t take anything away from either, but this is all my opinion! Both islands are experiencing major changes. But, then, where in the world isn’t? To me, Malta is very crowded and very busy. Construction is literally unavoidable. It is loud, chaotic, and growing – with seemingly no end in sight. But I absolutely love the diversity of the island in every respect. The combination of amenities with natural beauty is a rare find. But I do worry for that natural aspect. Roatan is still quiet and natural. But I also believe it is on the verge. More tourists, more expats, more influx from all sides will increase the need for construction. I just hope that high rises never reach the shores of that beautiful gem. Malta offers incredible history, cultural diversity, and amazing convenience for travel. Roatan offers pristine natural beauty and a simplicity that can be hard to find elsewhere these days. But that simplicity also means a complete dearth of activities or options beyond nature and drinking. There are no theaters or cinemas (*Edit: I’ve been informed there’s now a single movie theater! Thanks to Sol y Mar for finally offering that option to residents and visitors alike! ), few shopping options and not much else to do except hit the bars every night. Of course, there are occasional fun events – the Music Festival for the Angels being one of my favorites! But the comparison of diversity of activities is just not fair between these two islands. Both Roatan and Malta offer expats an island home boasting sunshine and sea views. Both islands are very popular expat destinations, and deservedly so! These islands offer welcoming environments and lifestyle changes that every expat is seeking. A like-minded community and empathetic souls live in both places. I am eternally grateful to have lived on these islands. My luck and my privileges have allowed me to enjoy life in many different places so I can find what’s best for me. I know this isn’t an option for everyone. But I do encourage you – if you are at all able – to move. Go live somewhere else. Find a place that speaks to you in some way and spend some time there. You will be forever changed and I promise that you will grow so much more quickly as you are forced to navigate this new life. I only hope that the information and insight I offer here is helpful for you! I’m always happy to help with more resources and potential contacts if you’re planning to move to any of the countries I’ve lived in so far. This entire site is filled with my opinions and stories dedicated to making life easier for you! Don’t be afraid to reach out if you need more help. We also housesit and petsit our way around the world. You can learn all about TrustedHousesitters (our preferred housesitting website) here.